Unlike the procedures for electing the president of the republic (for which a separate law with elaborate procedures exists) the nomination of the Iraqi prime minister is governed entirely by the Iraqi constitution. As a result, the selection of the prime minister candidate is arguably the most sensitive and unpredictable stage of the Iraqi government formation process. With respect to the Iraqi constitution, it simply says in article 76 that within 15 days of his election, the new president must charge the candidate of the largest parliament bloc to form a new government within 30 days. The new cabinet will then be presented for parliament for approval by an absolute majority – for ministers individually, as well as the cabinet programme. 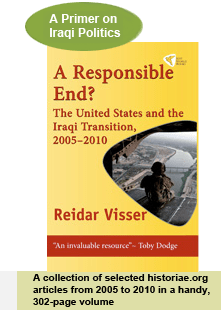 Beyond the constitution there is an opinion by the Iraqi federal supreme court – no. 25 of 2010 – that sets out to clarify some of the vagueness of article 76. This piece of constitutional jurisprudence has been cited (and criticized) far more than it has been actually analysed. What the opinion does is basically two things. First, it provides a specification about what is meant in article 76 of the Iraqi constitution on the duty of the president to charge the candidate of the largest parliamentary bloc to form the government. On this, the opinion suggests that it is irrelevant whether the bloc was formed before or after the election, which was an issue of contention in 2010. The opinion on this is quite logical and not as contrived as has been suggested since the constitution talks about parliamentary bloc (kutla niyabiyya) rather than electoral list (qaima). However, secondly, the opinion of the court goes on to introduce a point whose relationship with the constitution is more unclear. It establishes a cut-off date for bloc formation by saying that what counts is bloc size at the time of the first sitting of the new parliament. It is not clear why, after the general principle of post-election bloc formation has already been admitted, there should be any reason to consider the first meeting of parliament as particularly important from the constitutional point of view. After all, parliament can be expected to have several meetings before the PM is nominated even if the constitutional timelines are strictly adhered to, and it would for example be far more logical to establish a cut-off point following the election of the president, when a 15-day window for finding the PM nominee begins. In any case, what all of this suggests is that the Iraqi constitution is far from crystal clear on the nomination of the PM, and that at least a degree of presidential discretion should be taken as a given – and certainly with respect to what point in time the “largest bloc” should be estimated. However, although Iraqi politicians have engaged in a ridiculous amount of correspondence to indicate their bloc size at the time of the first parliament meeting on 1 July, it really is a different problem that is now more acutely coming into the foreground. The problem is that Iraqi factions seem to cling to the erroneous view that the right to form the next government is governed by bloc size alone. That view is misleading. There are two elements in the constitutional instructions for the president: He needs to identify a bloc, and a candidate. Blocs are only relevant for purposes of government formation if they also have a candidate. Candidates with no blocs are irrelevant; as are blocs with no candidates. In other words, a bloc does not have a right to form a government by virtue of size alone. And that is why all the calls for the Shiite alliance to be charged with the premier nomination, as an assumed “right of the bloc”, in the current situation are beside the point, since the Shiite alliance doesn’t have an agreed PM candidate. A bloc with no PM candidate has no right to even enter the discussion of government formation, no matter its size. The biggest bloc in the Iraqi parliament that also has a PM candidate is currently State of Law, whose candidate of course is Nuri al-Maliki. Members of this bloc, including Maliki himself, are now explicitly demanding the right to form a government, separate from the rest of the putative pan-Shiite alliance. Unless a bigger bloc comes up with a candidate before the constitutional timeline for PM nomination expires on 8 August (or a few days later if holidays are counted), President Fuad Masum has a constitutional duty to charge Maliki with forming his third government, regardless of whether he has a realistic chance of reaching an absolute majority when he presents it to parliament for approval or a second attempt by another candidate will be needed. Whether this second scenario will come into play remains to be seen. Noteworthy in this respect is the almost sensational amount of presidential discretion that exists in the case the first PM nominee fails. The president ‘s job, in that case, is simply to find “a new candidate”. Yes, you read that correctly – article 76-3 of the Iraqi constitution. It doesn’t say which bloc the second candidate should come from, just that it should be a “new candidate”. Apart from the general age and education requirements of article 77, there is, in other words, nothing much to go by. In theory, then, the president’s mandate in the potential case of a second PM nomination could be interpreted as using his political skills to select whomever he thinks has the greatest chance of carrying an absolute majority in the Iraqi parliament . Iraqi politicians now have the rest of the Eid and the next weekend to contemplate these issues. But soon they will have to go beyond the debates about numbers and focus on the premier candidates themselves. This entry was posted on Tuesday, 29 July 2014 23:22 at 23:22	and is filed under Iraqi constitutional issues. You can follow any responses to this entry through the RSS 2.0 feed. Both comments and pings are currently closed. This was a particularly useful contribution, Reidar. I hadn’t heard the entire PM nominating process–plus its various warts–laid out in quite this detail & clarity. Thank you. WW. One might argue that there are three candidates for nomination by the National Alliance, to wit : CHALABI – ISLAMIC SUPREME COUNCIL, MAHDI – LIBERAL and KHOZAIE – STATE OF LAW. Is there no mechanism for selection of a single nominee within the bloc structure of the NA ? And, what of ” press ” such as the following ? So let’s be clear: Chalabi is the candidate of (maybe) the Sadrists (your “liberals”) with around 34 seats, Abd al-Mahdi of ISCI (maybe 31 seats). No idea where you get Khuzaie from. No one has nominated him; he’s from the Maliki bloc. Maliki is definitely the State of Law candidate with around 102 seats, more than any other candidate by a far margin. The NA has largely given up agreeing on an internal decision mechanism – the smaller parties demand consensus and State of Law rejects this. The article is about the constitutional aspects as they relate to the current line-up of actual candidates; not about rumours in the press. Tomorrow’s Press / MP for the coalition forces Iraqi Ahmed Attia, Sunday, that the National Alliance sent yesterday to the coalition three names would be an alternative to the current Prime Minister Nuri al-Maliki, stressing that the names mentioned are Khodair al and Ahmed Chalabi and Adel Abdul Mahdi. He told ‘tomorrow Press’, the ‘National Alliance abandoned the nomination of Prime Minister Nuri al-Maliki has sent us, on Saturday, three new names as substitutes for they Khodair al-Maliki and Ahmad Chalabi and Adel Abdul Mahdi’. He pointed out that ‘these names are in negotiations and discussions within the National Alliance, as well as Sunni and Kurdish forces’. It is difficult for me to separate rumours in the press from real information which is why I have engaged this forum. Very recently the press has stated that Shahristani and Amiri may have ” jumped ship ” on the SLC. Any truth to such ? MP for the Liberal bloc Riad al-Saadi, Wednesday, that the National Alliance has five candidates for the post of prime minister, including al-Jaafari and al-Shahristani, while noting that Prime Minister outgoing Nuri al-Maliki, to withdraw his candidacy for the job because of political pressure. Saadi said in an interview for “Alsumaria News”, “The National Alliance has five candidates for the post of prime minister,” noting that “three of these candidates of the National Coalition they Ahmed Chalabi and Ibrahim al-Jaafari and normal Abdul-Mahdi and the other two from the state of law and two Khodair al Hussain al-Shahristani “. He said the religious authority, Mr. Mahmoud Hashemi, in July 29, 2014, that the nomination of president of the new government in Iraq must be determined as set apart by the polls, stressing the unnecessary adherence to constitutional entitlement to the new government. The differences are still going on within the National Alliance for the selection of the prime minister for the next government at a time, which is still state law clings Nouri al-Maliki as prime minister, the other blocks within the coalition of the Liberal and the citizen refuses this nomination, as well as the other blocks out of the coalition is still continuing in its refusal Cutter to take over as prime minister Nuri al-Maliki for the third session. Mr. Dennis, almost everything you post here is from dubious sources featuring even more dubious translations. None of this is particularly interesting since it is all mere rumours. If you’re interested in Iraq I would encourage you to learn Arabic which would put you in a much better situation to differentiate between various sources as regards their newsworthiness. Thank you for your reply. Going to work on my Arabic. I shall not bother you again. Shouldn’t point 4 precedes point 3 so the process starts making sense? If taken step by step, it would be to name the ministers first, get absolute majority to form the cabinet, and if failed, then ‘next’ i.e. point 3. Or am I reading it incorrectly? Thanks as always Reidar. Enlightening article. And above that, in article 76-5 the new nomination thing gets repeated, though arguably there is a distinction between a PM giving up on forming a govt (76-3 perhaps) and parliament explicitly rejecting it (76-5). Though the principle of presidential discretion to find “another”/”new” candidate remains the same. I suspect there may be nothing deeper to this than the fact that the Iraqi constitution was drafted in great haste and is full of errors, lacunae and contradictions. The contradiction between articles 115 and 122 re the powers of the governorates is but one of several glaring examples. Iraq problems hinged to a leader as PM. All names that given or promoted or some western suggestions made about them I believe have similar if not same Maliki problems. RV, do you agree with this? In your view is there away Iraq could get new face as PM instead iof these lingering four or five names? Salah, I don’t see any sudden surprises here. Tareq Najm is the least known of the 4-5 names that recur (others being Abd al-Mahdi, Chalabi & Shahristani) and some will possibly give him the benefit of doubt compared to the others. With Abd al-Mahdi I would expect a return to CPA-era politics (“governing council”) with no clearly defined centre of power. Chalabi and Shahristani also lack substantial party bases but would likely be more prone to try to repeat the Maliki model of centralising power, probably with little success though. Reider– if the Kurds offer their 53 seats/votes to a consensus candidate from ISCI and Sadrists, would this then constitute a larger block than State of Law (assuming that Nujaifi and Mutlaq plus secularists would also join)? What probability would you give such a scenario –where KDP, PUK and Gorran support a Sadrist/ISCI consensus candidate? I would like to point out about some of those names you mentioned in your replay. As we know in western world and other countries, politicians should have clean criminal/ background when they promoted for top rank in the country politics. 1-Abd al-Mahdi, the Ziweya Bank Robbery? So this their history could you or Iraqis trust them? Hussain, your scenario might work in the world of mathematics, but, I suspect, in the world of mathematics only. I think a major consideration for the Kurds is that if they ally with Shiites in a formal bloc, it could also mean goodbye to the principle of internal Kurdish bloc cohesion and open the door for Maliki to chop away elements of the Kurdish bloc as he has always wanted to – PUK, Gorran, independents etc. Why shouldn’t he if the Kurds themselves surrender the pan-Kurdish axiom? There is bit of new before in some sources saying that Maliki refusal for leaving his roll to another guy, in fact depending to have some sort of protection for very serious frauds and miss use of his positions in regards to so many issues and corruptions during his terms. Today one of Arabic source highlighted this, look there is some credibility to the struggle of PM saga. قال مراقبون إن التطمينات التي طلبها المالكي تخص بدرجة أولى ملف الفساد، وهو ملف ثقيل، إذ ومنذ تسلم المالكي رئاسة الوزراء تم عقد صفقات تسليح كبرى مشبوهة، فضلا عن مشاريع إعادة الإعمار التي شابها الكثير من الغموض، والسكوت عن تهريب النفط لفائدة ميليشيات مرتبطة بأطراف شيعية حليفة.